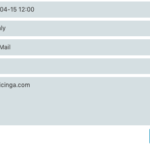 We’re happy to announce that we released an early version of Icinga Reporting today! With this release we create the foundation for an overall reporting functionality for Icinga by introducing a new way to work with collected data. 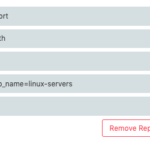 At the same time we are also publishing the first use case of Icinga Reporting which enables you to calculate, display and export SLA reports for your hosts and services. Icinga Reporting is the framework and foundation we created to handle data collected by Icinga 2 and other data providers. By definition Icinga Reporting does not collect or calculate any data. The framework processes usable data from data providers such as Icinga’s IDO or Icinga Web 2 modules and makes them available in different formats. The first version can display the data directly within the Icinga web interface or export it to PDF, JSON or CSV format. With scheduled reports you can receive the prepared data periodically via email. The IDO is the database where Icinga 2 stores all the status data it collects. It is also the first data provider for Icinga Reporting. We calculate the availability of your hosts and services over a certain amount of time and return a percentage value. This allows you to evaluate and compare the accessibility of you applications and network devices. 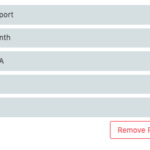 You can use the data to check if you’re meeting your SLA (Service-Level-Agreement) and share it with your team and managers. 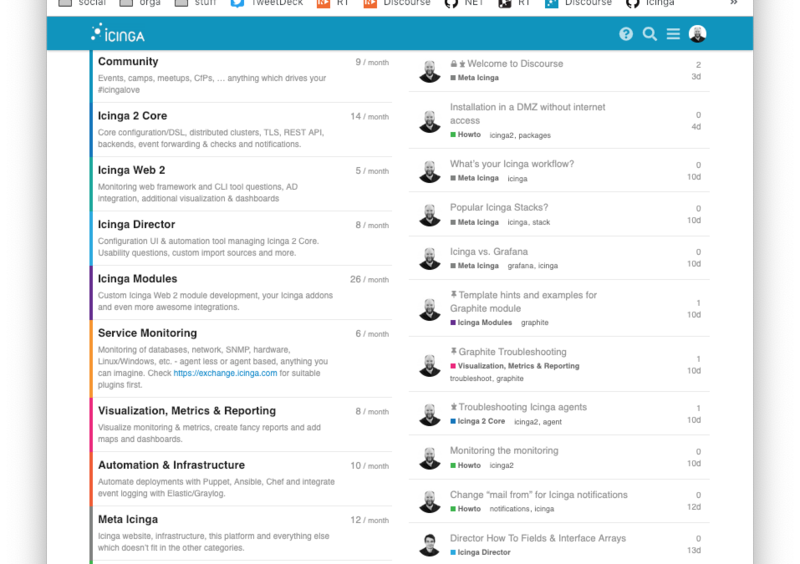 Icinga Reporting consists of multiple projects. 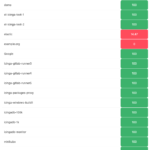 We’re continuously working on updating and extending our existing Modules to provide data for Icinga Reporting. This release is at a very early stage and your feedback is very welcome and appreciated. Join our community on community.icinga.com and have a chat with us about your reporting use cases and challenges! 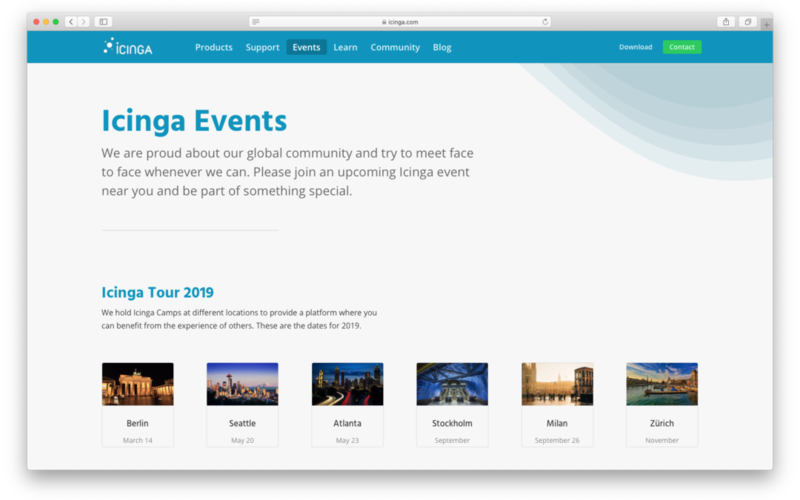 We will discuss Icinga Reporting on our upcoming Icinga Camps as well. The CfP for Stockholm, Milan and Zürich is still open for those who are interested in speaking at these events. 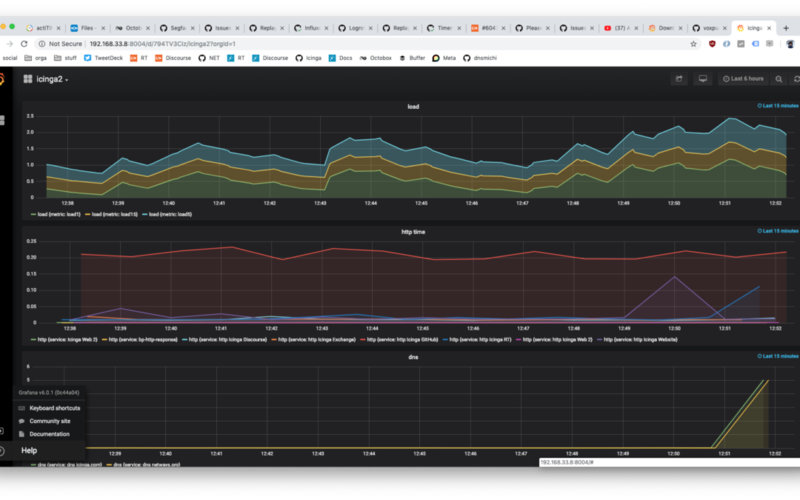 This release provides fixes for the InfluxDB and Elasticsearch metric writers. If you’re using TLS connections, the latter were not closed correctly. In addition to these fixes, we’ve also backported fixes for delayed and one-time notifications. Special thanks to mdetrano for being patient and testing this one. Additionally, the Windows wizard has been updated and check_perfmon now supports non-localized performance counters. One of our customers sponsored improving mass-creation of downtimes via the REST API in HA enabled clusters, thank you. Official packages are available on packages.icinga.com, have been pushed to Chocolatey and Raspbian will follow soon. Meanwhile check the changelog for v2.10.4. January brought us many new things for 2019. There’s more to come in our 10th year. Icinga meetup organizers also have been busy, and I am very happy that Berlin happened last week at SysEleven while Salzburg users meet today at nic.at. Thanks a lot to the organizers and sponsors for such delightful community events! Still not registered for Icinga Camp Berlin? 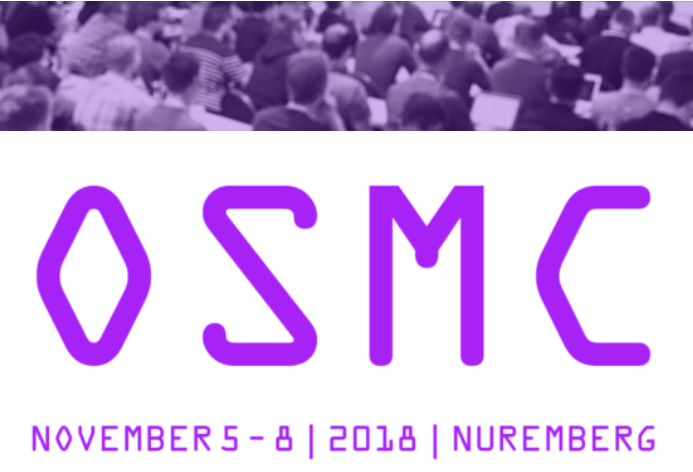 Here’s the agenda, and of course there will be time to discuss the things I share here 🙂 Carsten will be there sharing unicorns! Using your own company’s CA for cluster & REST API communication? See you soon at Icinga Camp Berlin! Our community is more than just helping with questions, sharing experiences and tailoring monitoring together. We’ve grown so much in the past 10 years that we always seek to improve the conversation. 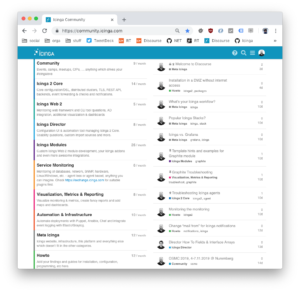 You’ve seen our many Icinga Camps, keep following our social media channels, engage with developers on GitHub, read our blog … one thing is gladly missed: Our very own discussion platform which combines a forum with a mailing list and also enables quick chats known from IRC channels. 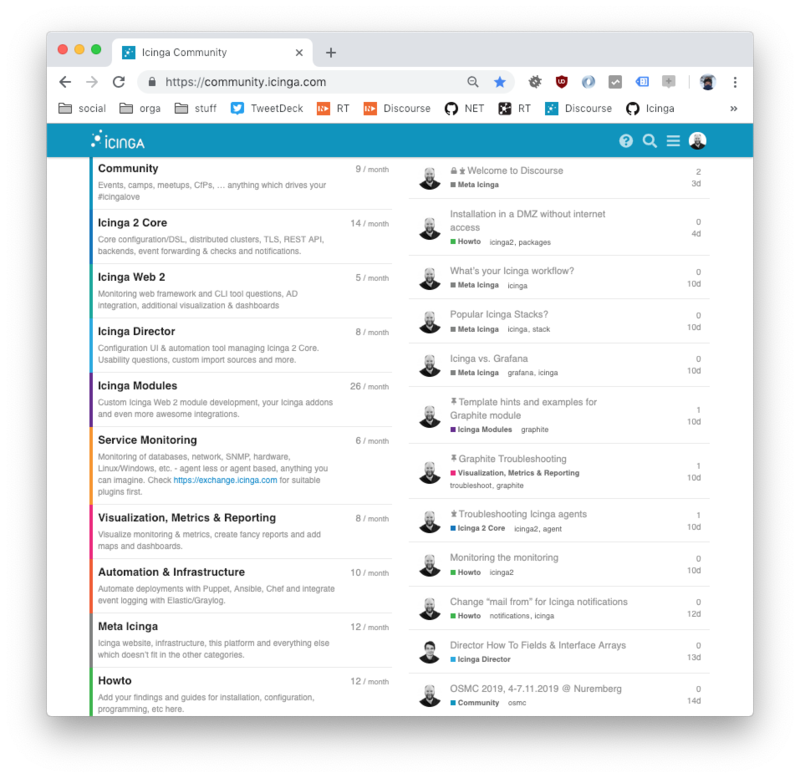 We are proud to announce our new official community platform: Icinga Discourse. We’ve made sure to add the most valued content, howtos and questions there already. Now you just need to signup with a new account (hint: you can also use social logins like GitHub or Twitter) and join the conversation! Discourse is built for the modern web, with endless scrolling, mobile views and much more to make it easy to start a discussion topic. We’ve also enabled the “mailing list mode” which allows you to reply to conversations from your mail client. Read more in the announcement post. Oh, and by the way – say hello to our new shiny website. We’ve lifted and enhanced several product pages and made it easier to look for supported platforms and offers. Look around and let us know what you think!